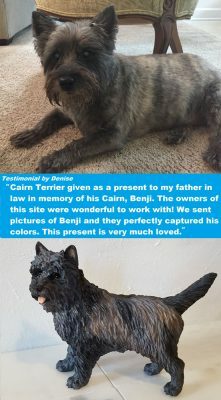 Cairn Terrier given as a present to my father in law in memory of his Cairn, Benji. The owners of this site were wonderful to work with! We sent pictures of Benji and they perfectly captured his colors. This present is very much loved. Thank you, Kimberly! I had an exceptionally good experience! Special thanks to Kimberly for the custom markings that match my daughter’s dog so well. She is very pleased with it. Also thanks for the many conversations when I made a mistake with my address. I’d recommend your store to anyone wanting this service. Almost as adorable as my real pup! It looks great- thank you so much! The figurine is PERFECT and just darling! [We will be ordering] a couple more too. Can’t wait!! Looks just like our little Winnie! The figure looks beautiful. I work at an animal hospital and this was one of my co-workers dogs who recently passed away. It will look very nice on top of the urn the his ashes were returned in. I will keep you in mind for any future figures I may need. Thank you for the wonderful memorial gift for my niece! I appreciate your patience while we gathered photos of Bailey, and your attention to detail of the color and markings of all sides of the dog. I was so pleased to give such a special gift, it is truly an artistic creation. I will remember this for future gifts. [The figurine] looks so cute – I know my Granddaughter will be pleased. The likeness was heartwarming down to the white tipped tail. I think it captured our Buster’s spunky personality even though technically our pup was a mixed breed. Buster was a wonderful friend to our family for eleven years, and he just passed on April 4. He was a happy dog that loved to bark and play and make us smile. This little figurine helps me remember why Buster made us so happy. So cute. I’m impressed with the attention to detail. It was very fine work and a wonderful likeness. Thank you very much for Buster, the angel dog. We ordered a figurine from Dog Lover Store two years ago before our cake topper at our wedding. We had them do a replica of our Australian Shepherd/Border Collie mix and they did a wonderful job. 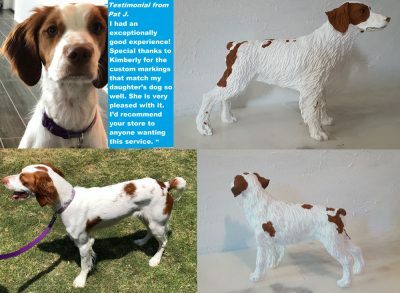 Kimberly was wonderful to work with and was extremely receptive to the feedback we gave after she sent draft pictures so that the coloring of the coat on the figurine matched that of our dog’s. We had a destination wedding and we weren’t able to take our pup with us and this allowed us to have a piece of her there. Although the figurine was initially a special token from of our wedding day, it has became even more special when our dog unexpectedly passed away two months after our wedding. We now have our figurine placed in a spot in our house so we see it everyday. It has become a beautiful token of remembrance. We are very thankful to have it. [The figurine is] PERFECT. Oh my, I’m going to cry!!! She is beautiful. She is absolutely perfect. Thank You. It’s perfect! Our daughter just lost her 15 year old husky. This is to be her Christmas ornament this year. She will absolutely love it! Thank you! [The figurine] is PERFECT, GREAT WORK! Perfect !!!!! Thank You so much. Reminds me of my Max. Thanks again. [The figurine] is basically perfect. Thank you so much! You guys have been amazing! Excellent customer service. You captured beautifully her white chest and white tipped back paws. This is a Christmas present for my husband and I think he is going to be thrilled! I can not tell you how thrilled I still am with my figurine. It looks so much like my Dean Martin and gives me an instant feeling of love and comfort every time I pass by it. We actually had a small house fire a year ago. I thank God my Deanie figurine was unharmed. It is as beautiful and cherished today as it was the day I received it. Keep up the great work! Thank you so much!! It looks great! Is in memory of one of our beloved dog that we lost a couple of weeks ago. [The figurine] is wonderful- thank you!! It came in the mail yesterday!! It looks so amazing!! Thank you so much!! It looks beautiful. Thank you so much. Thank you, the figurine looks amazing! I’m so excited to show my fiancé! It looks fantastic. Can’t wait till it gets here. Thank you so much. Looks awesome. Actually, my husband was shocked how much it looks like Boomer. I sure appreciate your kindness. That looks amazing! Love it, thank you. [The figurines] look wonderful! My daughter, who they are a birthday present for, will love them as much as I do. They will always be such a special, happy reminder for her of her precious pups. Thanks again so much. We got the figurine and it looks so much like Socks…….Thank you so much from a Doggie mom that misses one of her babies. I love it! Perfect! This is going to be the perfect gift! I just got the dog in the mail and it is even better than I anticipated! So perfect!! Thank you so much for your patience and understanding with my requests. I am so very pleased. [The figurine] looks awesome! Just like her! Thank you! It’s a remarkable likeness that will be cherished by my father. Thank you so much! It’s so beautiful and perfectly made!! Thank you! My family will be so happy when the see it. I’d like to say that the process was very easy and quicker than I expected. The detail was awesome and the conversation about which base breed to pick really helped us get this figurine to look as much like the real thing as possible considering he’s a mutt. His mom loved the gift! That’s my beautiful boy!!! Thank you!! I love it. I am very happy with the custom hand-painted figurine you crafted for me in 2016. It is a beautiful representation that reminds me of my sweet little companion. The detail and colors were lovely. My father was so happy with the boxer dog figurine. It was painted with such care and we really appreciated all the attention to detail; the likeness was uncanny. Thank you! It was perfect! For months I had been searching all over the internet to find a close replica of our English Bulldog, Luigi, to use as our cake topper for our upcoming wedding. I came across Dog Lover Store and loved their process and past client reviews, so I gave it a shot. Right away I was contacted about pictures of Lou. Within a couple of days I was sent photos to approve of and could not get over how great they looked. The replica is a spitting image of Lou even down to the freckles on his ear and to his brindle fur! I am OBSESSED and can not wait to use on our cake! Could not recommend their services more! Thank you for everything! Thank you for the wonderful job you did on our Jasper angel. It made my wife cry – in a good way. It was a remarkable resemblance. I just wanted to let you know how happy I am with my figurines. I was surprised at the weight of each – very solid and high quality. Thank all of you so much for beautiful replicas of my precious pups. Oh my gosh. It is perfect. Thank you so much. You may not know how much your work means to people, but this is so helpful as we grieve the loss of our baby Aster. So, thank you from the bottom of my heart for taking such care and making such a beautiful likeness of her. Again, please leave work today knowing how much good you’ve done for me and my family. Thank you.